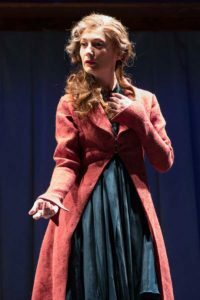 Katie deBuys as Hermione in The Winter’s Tale, Folger Theatre, 2018. Costume design by Kelsey Hunt. Photo by Teresa Wood. This one is less about the costume, since the key to pulling off Hermione is to strike dramatic statue poses throughout the evening. 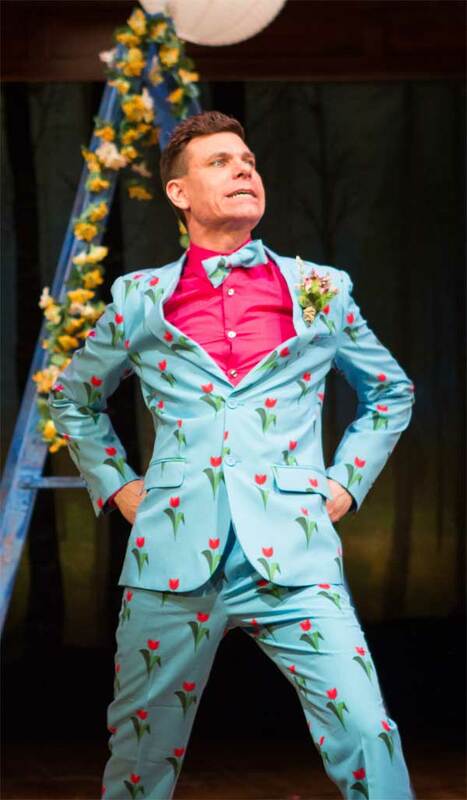 Zachary Fine in The Two Gentlemen of Verona, Folger Theatre, 2014. Costume design by Whitney Locher. Photo by Teresa Wood. This one is sort of cheating. You just need to dress as a dog. 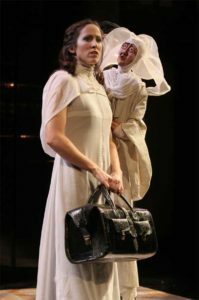 Karen Peakes as Isabella and Tony Nam (puppeteer) as Francisca in Folger Theatre’s production of Measure for Measure, 2006. Costume design by Devon Painter. Photo by Carol Pratt. White sheets are so versatile: You can use them to dress as the ghost of Hamlet’s father, drape them as a toga for a character out of Julius Caesar or another Roman play, or fashion them into a nun’s habit. 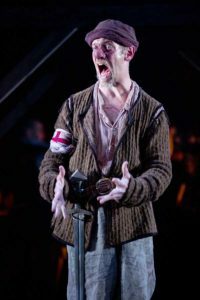 Louis Butelli as Bardolph in Henry V, Folger Theatre, 2013. Costume design by Mariah Hale. Photo by Scott Suchman. The key to this costume is the big red nose. 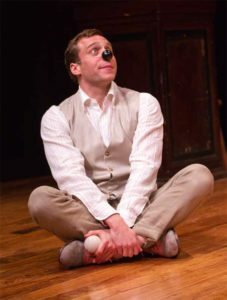 Aaron Krohn as Touchstone in As You Like It, Folger Theatre, 2017. Costume design by Charlotte Palmer-Lane. Photo by Teresa Wood. If you’re going in costume as a motley fool, don’t hold back.